Summary: Microsoft Scripting Guy, Ed Wilson, shows how to easily decrypt the Windows PowerShell secure string password. Hey, Scripting Guy! We have an FTP site that I have to use on a regular basis. I need an easy way to get a credential and use that credential with the FTP site so that I can download a file that changes on a daily basis. I found a few scripts and functions on the Internet that will decrypt the secure string password from a Windows PowerShell credential object, but they all seem really complicated. Is there an easy way to do this? Microsoft Scripting Guy, Ed Wilson, is here. Today I am sitting here drinking a cup of Earl Grey tea with a pinch of lavender in it. I love the way the two flavors complement each other. As I look over my email, I ran across your question. Although you did not include a link to the complicated versions of the scripts and functions you ran across, I will venture to say that my method should be relatively painless. Note What I am showing here today is exactly by design, and is not a hack. I love using the Get-Credential cmdlet to retrieve a credential object. It is already set up to work; and therefore, it is easy to use. If I need credentials, I do not need to mess around writing HTAs, creating various WinForms to prompt for a user name and password, or worry about how to mask the password—all of which were problems before Windows PowerShell and the Get-Credential cmdlet. So, like I say, I absolutely love it. To use the Get-Credential cmdlet, I generally store the resulting credential object in a variable. (I do not have to do so, because I can use it directly if I need to, but it is more flexible to store it in a variable.) Here is the command. When I run this command, a dialog box appears. The box is already set up to use, with a user name on the top, and it masks the password in the bottom box. The box is shown here. The problem with the Get-Credential cmdlet is that it returns a PSCredential object. In itself, this is not an issue, but it does mean that I can only use the credential object for cmdlets and for other items that know what a PSCredential object is. Not even all .NET classes know how to deal with a PSCredential object, so when it comes to connecting to legacy databases and things like websites and FTP sites, there is little hope of being able to use the object directly. Luckily, I can use the Get-Member cmdlet to look at the members of a PSCredential object. The members are listed here. At first, it looks like things are relatively easy. If I want to see the user name, all I need to do is access the UserName property as shown here. That is cool. Now what about the password? When I access the Password property, it returns SecureString. This is shown here. Hmmm, what if I look at the members of SecureString? I pipe it to the Get-Member cmdlet, and I see the following members. Ok, cool. I will try the ToString method and see what happens. What if I try the Length property? Does it give me anything? It does.This is promising. I can at least write code that checks the length of the password and provides some sort of feedback to users regarding the length of the password they supply. It could be rather a cool solution. What if I use the ConvertFrom-SecureString cmdlet? This is a standard Windows PowerShell cmdlet, so I decide to pipe the password to the ConvertFrom-SecureString cmdlet. The following illustrates the output. This latest representation is a string, and therefore there are no more options available for decrypting the password—at least, none that are very direct or easy to use. The solution, is to go back to the PSCredential object itself. It has a method that is designed to help with the exact scenario. I need to provide credentials to a legacy type of interface that does not know how to handle a PSCredential. Therefore, I need to be able to get both the user name and the password in an easy-to-use and easy-to-digest manner. 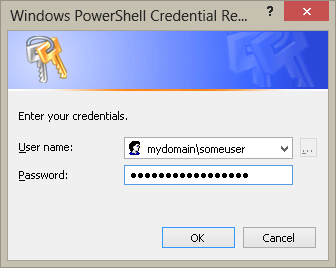 When I call the GetNetworkCredential method from the PSCredential object, it returns the user name and the domain name. This is shown here. If I pipe the returned object to the Get-Member cmdlet, however, I see that I now have a NetworkCredential object. The members are listed here. I see the password has a SecureString for the SecurePassword property, but there is also the Password property that is a plain string. So, I pipe the NetworkCredential object to the Format-List cmdlet and the following appears. If I need only the password, I simply retrieve the Password property as shown here. By the way, I can also get the password length here. This is because all string objects contain a Length property. This is shown here. AD, that is all there is to using the NetworkCredential object. Join me tomorrow when I will talk about more cool Windows PowerShell stuff.